The Special Educational Needs and Disability Code of Practice makes it clear that all teachers are responsible and accountable for the progress of all learners in their class, including where they access support from teaching assistants or specialist staff. In a previous article, I made reference to the fact that inclusive high-quality teaching is the first step in responding to those with SEN (or indeed those without) and shared some of the elements that make up an inclusive lesson (High-quality and inclusive teaching practices, SecEd, September 2017: http://bit.ly/2xJ3UFF). However, even when you have all these elements of inclusive high-quality teaching in place there will still be some individuals who are struggling to make progress as a result of their additional needs. So what do you do next? Students who continue to face challenges in their learning, despite receiving high-quality teaching, are likely to need additional strategies, or different provision, in order to meet their needs. The SEND Code of Practice states that, for these learners, teachers are required to remove barriers to learning and put effective special educational provision in place through SEN support. 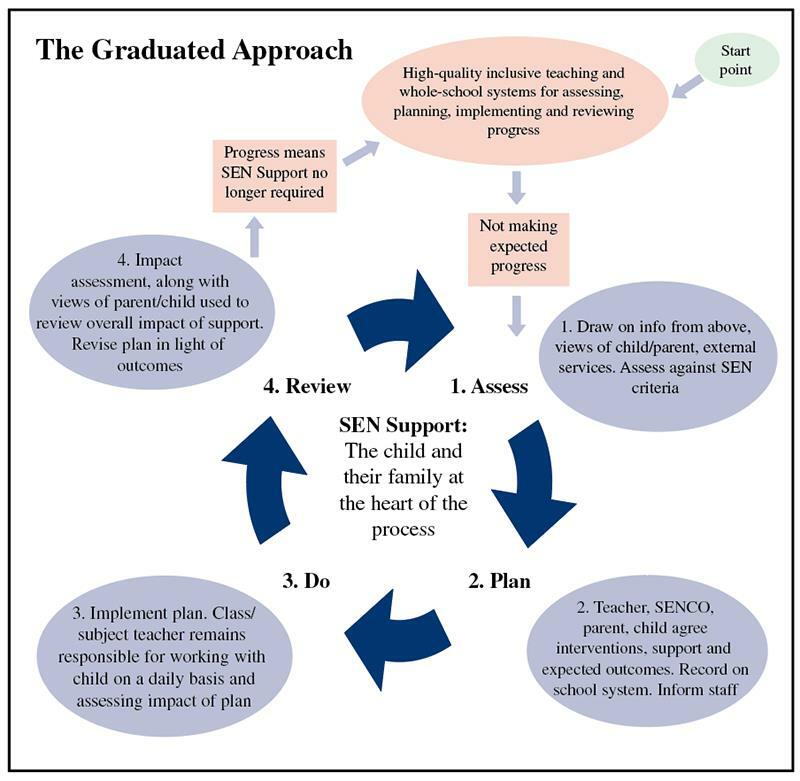 This SEN support takes the form of a four-part cycle (assess, plan, do, review). Through this cycle, actions are reviewed and refined as understanding of a student’s needs and the support required to help them secure good outcomes increases. This is known as the graduated approach. Note that the child and their family are right at the centre of the cycle. Starting with them and gathering their views is essential to ensuring the graduated approach works effectively. In the past, implementing this sort of cycle might have been seen as the responsibility of the SENCO. However, the SEND Code of Practice makes it clear that this cycle is for teachers and that they have a key role to play in each of the stages. So what might this look like in practice? Initially, the graduated approach involves you using the information you gather from your on-going, day-to-day assessment to make judgements about the progress a student is making and to alert you to any barriers that may be getting in the way of them making comparable progress to their peers. Standardised reading, spelling or mathematics tests. Other diagnostic assessments such as cognitive abilities tests (CATs). Use of profiling tools to identify detailed needs, such as for speech, language and communication needs. Screening assessments, such as for dyslexia or dyspraxia. Request for advice from a specialist professional. It is likely that the SENCO will arrange for any additional assessments to take place. However, it is important that your on-going assessment information is used to inform the overall picture of the student, and that following additional assessments, any information that could have an impact on your teaching is shared with you. This part of the cycle involves discussing, planning and agreeing what will be put in place as an outcome of the assessment information gathered. The planning should involve the student, parents and staff from the school who know the pupil well (this could be the form tutor, key-worker, SENCO or another member of the SEN team). Where other professionals are working with the child, they should also contribute to planning. The initial step of the planning process includes agreeing targets for the student in order to focus attention on key areas and give them a clear idea of what they need to do to improve their work. Specialist programmes or a personalised curriculum. Working in a small group – e.g. for an intervention. Peer support or extra support from an adult. Physical or personal care support. Whatever form ISPs take in your school, it is essential you become familiar with the information on them. Use the ISPs to get to know your students with SEN and to inform your teaching and learning. This is particularly important for students with complex needs who have Education, Health and Care Plans (EHCPs). The information provided about these students is likely to be more detailed. The Code of Practice makes it clear that it is the responsibility of class and subject teachers to implement the plan on a day-to-day basis. This might seem quite challenging, but don’t forget that the SENCO is there to help. Delivering high-quality teaching to the student in every lesson. Implementing any adjustments, specific strategies or approaches to classroom teaching that have been identified in the ISP. Managing any teaching assistants who are supporting students with SEN in your lessons. Implementing any targeted interventions or specialist provision where this requires the involvement of the teacher. Continually assessing and monitoring the student’s progress and making any necessary adjustments to planning and teaching as a result. Communicating regularly with the student their parents, the SENCO and any other staff involved in order to establish how things are going and whether any changes are required. Some students will be involved in interventions to develop the core curriculum areas of literacy or numeracy or to improve other key skills such as communication, social and emotional skills or motor skills. If one of your students is involved in an intervention, make sure you know what the purpose of it is, what key skills are being taught, and how you can support the student to transfer these skills back in to the classroom. The SEN review will provide an opportunity to focus on the specifics of the support plan and to formally evaluate how successfully the support is meeting the needs of the student. The reviews may be incorporated as part of existing parents’ meetings or progress days or may be arranged as dedicated meetings. Depending on your role, you may or may not be directly involved in the review meeting. Even if you are not expected to attend the meeting, you should still be contributing to the review process. This means keeping evidence of how well the pupil is progressing within your class and how effectively the additional support strategies are working. What progress has the student made? Have they achieved their agreed targets and what is the evidence for this? What impact has the support/intervention had on progress? What are the student’s, parents’ and professionals’ views on the support/intervention? What changes need to be made to targets or provision next term? A record of the outcomes of the review discussions should be kept and used to update the student’s ISP. The assess, plan, do, review process is a cycle – the idea being that this process is continual. If the review shows a student has made really good progress, this may mean they no longer require the additional provision made through SEN support. If this is the case, the student is likely to be taken off the SEN record and, instead, will be monitored to ensure progress is sustained through inclusive high-quality teaching. For others, the assess, plan, do, review cycle will continue and targets, strategies and provision will be revisited and refined. In successive cycles, the process becomes increasingly personalised as everyone develops a growing understanding of the student’s barriers to learning and the strategies needed to enable them to make progress.